YouTube sign up and how to create YouTube account without Google Plus or Gmail. How to create new or multiple YouTube channel on an account. Important things you need to know before signing up for a new YouTube account. Explanations on how to create a YouTube account and how to create new YouTube account without Google plus or Gmail (with an existing email account). Also includes guides on how to create new YouTube channel and how to create multiple YouTube channels on one single Google account. Information on YouTube sign up supports for mobile devices and game consoles (iPhone, Apple TV, PS3, Xbox One and Android devices). First you have to know that you will need a Google account for Google to identify and recognize you as you log into YouTube or any other Google products across Google including Google Plus, hangouts and drive. It is not possible to sign in with an external account or a standalone YouTube account since Google integrated all its products. What it means is that if you have a Gmail or Google Plus account, you will automatically have a YouTube account and vice versa. However, creating a Google account doesn’t necessary mean that you have to have a Gmail account. You can create a Google account using your other email account such as Yahoo Mail or Hotmail. There is a field where you can enter your existing email account on the YouTube sign up page when you sign up for a Google account. If you have an existing Google or Gmail account, you can sign into YouTube using the existing account. If you don’t have any Google related account, you will have to create one by going to the sign up page which can be accessed from YouTube or any of the Google products. Click on the Sign in button from the top right corner of the page. Scroll down until you see a Create new account link. Click on it to open up the YouTube sign up form page. Fill in your details. 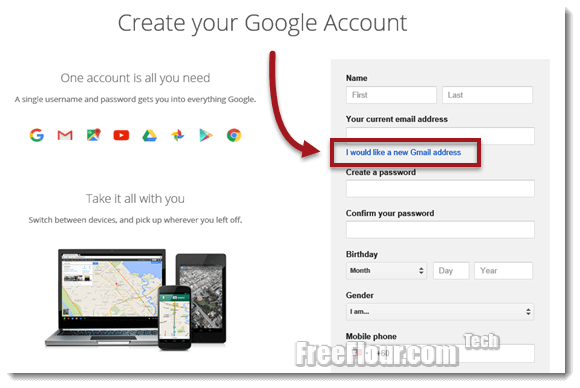 If you wish to create a Google account with an entirely new Gmail account, click on the I would like a new Gmail address link. Otherwise, enter your existing email you wish to use as your Google account for YouTube login. One friendly tip for when you sign up for YouTube account: Enter your birthday properly so that you won’t have problem when you view any age restricted videos on YouTube in the future. It’s also important that you can enter your mobile phone number so that you can retrieve your account easily whenever you lost it or got hacked. 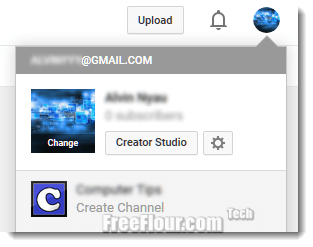 When you create a YouTube account, you will automatically be assigned a YouTube Channel using the name you have set in your Google profile. The YouTube channel is supposed to be representing you and your Google account and there is no option in YouTube to create any additional channel using the same Google account. However, it is possible to create multiple YouTube channel on a single Google account by using the Google Plus page feature. 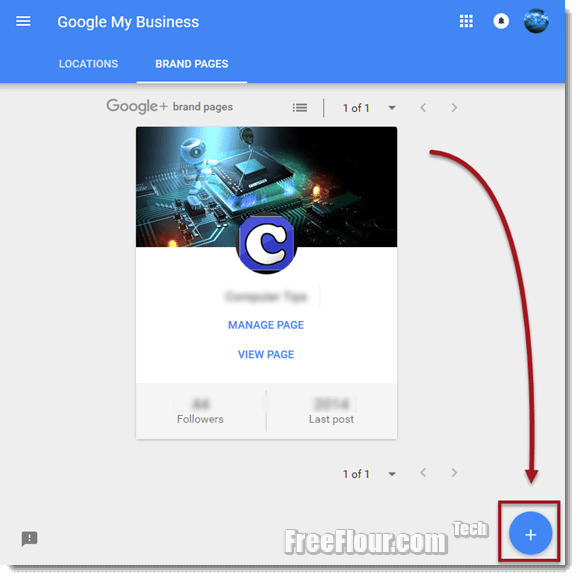 Google Plus allows you to create multiple page for people who have multiple businesses which they want to manage in a single Google Plus profile. These pages can have their own names which means you can set the name into anything you want and this name will then be used as your YouTube channel name. To create a new Google Plus page, go to your Google plus profile. From the left panel click on Page. Click on the Create a new page button on the right. Fill in necessary details to create a new page. Update: Google Plus Interface has been changed a little bit and the page section has been integrated with Google Business. Now you will need to click on the + sign on the bottom right corner of the page to create a new brand, aka page. When you have done creating a new Google plus page, go back to YouTube. From the drop down menu on the top, look for a link named All my channels. You can then select the newly created page under the Use YouTube As section. Update: You can now switch between your channels (or pages) on YouTube by clicking on your profile picture and then select your desired page. One thing worth noting about signing into YouTube from mobile devices or game consoles is that there might be a conflict between pre-installed YouTube app and the YouTube app from official Appstore. The most recommended YouTube app is the one you can get and update from the Appstore or Play Store. The easiest way is to simply access YouTube via browsers. As for PS3, you will need to verify your account by entering an access code which will be sent to your Google account before you can start using YouTube with your account. Google still doesn’t support YouTube on Apple TV yet.